Rashan Hoke starts as Park Slope's P.S. 282's new principal in September. 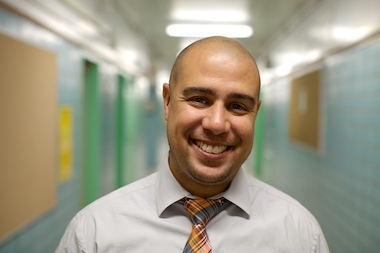 BROOKLYN — Rashan Hoke plans to spend the first day of school at Park Slope's P.S. 282 visiting every classroom to say "good morning" to all of the students and staff, while also glued to his walkie-talkie to make sure everything is running smoothly in the hallways. Hoke, who is taking over the struggling school following the departure of Magalie Alexis — the school's leader of 10 years who was criticized for being unresponsive to families and staff — is hoping to establish a new tone based on open dialogue. "We need to have communication and be transparent by giving constant feedback," Hoke said, "and make sure we're communicating not only with parents but with our teachers." Recent issues at P.S. 282, on Sixth Avenue near Lincoln Place, have included high teacher turnover, mistrust between parents and the administration and low enrollment among local Park Slope families, DNAinfo New York previously reported. Alexis stepped down as principal in June for reasons related to her family, according to a letter sent out by the district's superintendent, Park Slope Stoop reported. The Department of Education said that Alexis took a leave of absence, calling Hoke the interim acting principal. DOE officials said they didn't know how long the leave would last. Hoke, who has spent more than a decade in the city's education system, including as an elementary school teacher in northern Manhattan, said his goal for his first couple of months at the school is to take stock. "When we thought about the turnover and we thought about what does professional development look like, we thought, 'Do we just throw money and see what happens or do we start making some structured assessments about what we need and then focus on professional development," he said, indicating that he prefers to first get the lay of the land. Hoke began his career in education 12 years ago, when at the age of 30 he left his corporate recruiting job to become a New York City Teaching Fellow. He spent a decade teaching in elementary schools in Northern Manhattan and then served as an educational director for the Children's Aid Society, where he oversaw the after-school curriculum, he said. Hoke counts two principals he's worked with as mentors: Robin Sundick, who leads the Upper West Side's P.S. 84, which has a popular dual-language French and Spanish program, and David Cintron, who leads P.S. 214 in West Farms in The Bronx. As he works on developing a curriculum based on project-based learning, Hoke plans to keep P.S. 282's focus on the arts and gardening, he said. The school earned a "C" on its most recent progress report, but it also has bright spots: It's home to a team that won a national United States Chess Federation championship last year. "We have to be very cognizant that 282 has a lot of great things — like parent engagement, arts programming and extracurriculars — that we want to enhance," Hoke said. Greg Steddin, father of a fourth-grader and a fifth-grader in P.S. 282's gifted and talented program and outgoing Parent/Teacher Organization president, said he is "profoundly excited" about the change. "There had been a tremendous vacuum of leadership for the entire time I've been in the school," he said. "We are incredibly active parents and had an administration that was less so." After meeting with Hoke last week, Steddin was heartened to hear that the new principal seemed supportive of the school's topnotch chess team. Steddin has also already gotten positive feedback from several teachers, he said. "They are very much looking forward to stability, better support and rules that will be followed in an even way," Steddin said.